What is normal, anyway? Why it matters to you, Lee Young-Oh? As Beautiful Mind enters its third week, the tension and pressure escalate. Revelations are in order for a lot of people. It’s time to see where everyone is standing. When young Lee Young-Oh walked into his classroom, two or three classmates struck him from behind. He fought back and beat them until he took in his surroundings and stopped, confused. It turned out to be a birthday prank. His classmates had prepared a surprise birthday party. He realised his mistake and stared at them in regret. 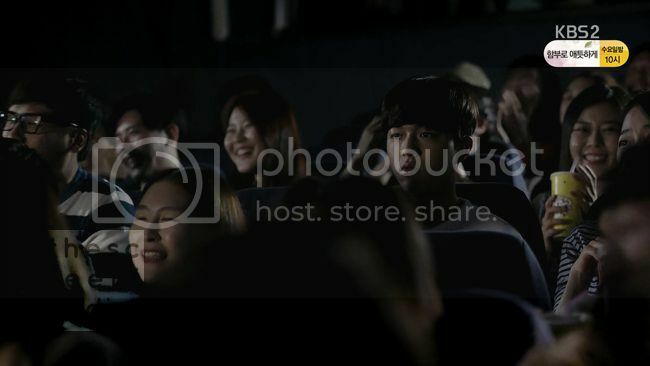 Next, young Lee Young-Oh was seen inside a cinema theatre. He was watching what seemed to be a comedy. While the rest of the audience were laughing, he watched them, tried to laugh with them, and failed. He quietly munched his popcorns, looking forlorn. Even in present day, he is still unable to do what his father had told him. It’s another cinema and a different film, a melodrama, and he munches his popcorn. When he realises people around him are crying, he stays quiet, not sure what to do, losing his appetite for popcorn. Lee Young-Oh is arrested for violating the Psychotropic Drug Control Act. Gye Jin-Seong also cites a possibility of a charge for Dr Shin’s and Kang Cheol-Min’s murders. But he has a surgery to finish. He dragged Gye Jin-Seong, who had cuffed her hand to his, along to the operating room, only to find that Dr Shim Eun-Ha’s surgery has been taken over by father Dr Lee Geon-Myeong. At the police station, as the senior detectives watch the interrogation and question her actions, as I do, Gye Jin-Seong tries to get confession though she says it doesn’t matter whether Lee Young-Oh talks. She’s got 48 hours to get him to confess. Besides, the test result on the ampoule found in his locker will be enough to put him away from operating room. But the test result bewilders everyone for it contains vitamins. Yet Gye Jin-Seong reasons that Lee Young-Oh doesn’t expect such result either. If he had known it was vitamins, he would have refused to be taken to the police station. Why would his father do that? Why would he get Lee Young-Oh arrested to be released again once the result for psychotropic drugs comes out negative? Why would his father let him be detained for 48 hours? Shouldn’t she figure that out before she put handcuffs on him? “It is not you who needs 48 hours,” he remarks. Gye Jin-Seong has to let him go. She learns the hard way about arresting people without solid reason and evidence. Lee Young-Oh rushes back to the operating room but Dr Shim’s surgery has been finished. He demands for Dr Shim’s surgery record. When Dr Kim Min-Jae’s sudden pat on his shoulder surprises him, he overreacts by pushing her to the wall in threatening manner, inciting fears and questioning looks from everyone around him. He sees his father and confronts him inside an elevator. Silence falls between them. Lee Young-Oh’s complexion changes, almost sad. Lee Geon-Myeong continues, “Young-Oh, the one thing I fear most is that people find out about who you really are. Like today.” Now Lee Young-Oh looks defeated. His father pushes the elevator’s button, the elevator’s doors open, and Young-Oh takes some steps back out. In another part of town, The Kangs go on a happy family outing. Senior Kang throws insults at Chairman Kang, criticising his throwing money in charities. Big Brother Kang orders him to contain any scandal, else it’ll hurt the Hyeon Seong Group’s stock value and they’ll suffer losses. Doctors are sent their evaluation. One is reprimanded for having low rate return, who then turns away a patient. Another is praised for having number of patients increased by 12% so he treats people around him better. Another is reminded that his CT Scan utilisation comes in sixth, so he prescribes an unnecessary scan to a patient citing that the other hospital’s scan result is poor. Dr Kim Min-Jae’s evaluation result sends her reeling. She fails to gain the professorship and someone else has taken credit for her work. She confronts her supervisor who dismisses her by saying that it’s the way the game is played. Dr Kim holds back anger as he tells her that she still won’t get the position even if she works harder, callously mentioning her less-than-stellar university background. When Dr Kim goes outside and cries, Lee Yeong-Oh, who has been waiting outside and then reads her physical cues, comforts her. His head assesses that it’s not difficult to act normal when someone’s sad. But she then asks why he didn’t ask her what went wrong like the other guys, to which he just says what matters more is that she looks sad. Their romantic interlude is accidentally witnessed by another doctor Lee Shi-Hyeon who scoffs at scene. “Genius my left foot! He’s just a normal guy in front of a pretty girl,” she shares her thoughts with Lee Young-Oh. That remark gives him a smug when no one’s watching. A normal guy, ay! The pity party is over as soon as they see a man with a helmet snatching a bag. They give chase as the man tries to escape on a motorcycle. But he drives himself to a wall. He falls down. When Officer Gye removes his helmet, he turns out to be Kang Cheol-Min’s son. Minutes after he walks out of her treatment room, Dr Shim’s vital signs monitor misbehaves. Everyone rushes to give aids but soon the heart monitor gives flat line. Dr Lee Young Oh pronounces her death in front of the nurses and doctors. He orders that her body will be treated as her family has wished, sent to her home-town. An ambulance has been prepared to bring the family and Dr Shim’s body. As soon as the ambulance’s door closes and it moves away, it’s revealed that she is not dead. Lee Young Oh plays tricks so that Shim Eun-ha can get out of the hospital. Before his plan kicked off, she gave him a code to where she has hidden her research findings, “my research is my pride”. Lee Young-Oh finds a USB flash drive in one of her trophies in her office. 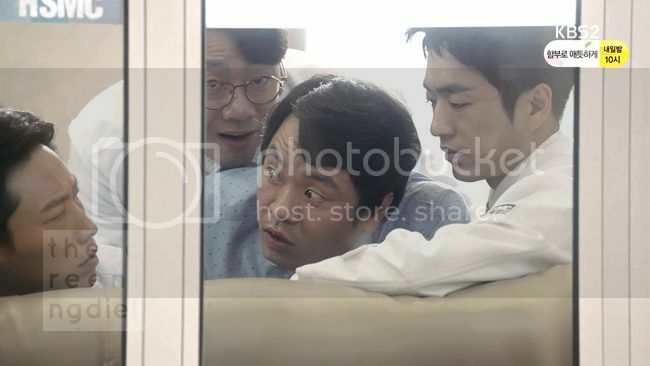 That rainy night, Lee Young-Oh talks to the anaesthetist Dr Kim Yoon-Gyeong, explaining that he thinks Dr Kim Yoon-Gyeong has murdered Kang Cheol-Min and Director Shin. She denies it but she is clearly upset and leaves as soon as an ambulance siren is heard. In her panic state, under the rain, she asks and searched whether there has been a child carried by the ambulance. She is looking for a child who can give her daughter a heart. She insists until Dr Hyeon stops and brings her inside the hospital. At the police precinct, Officer Gye tries to get Kang Cheol-Min’s son to eat. She chides him for refusing meals. She scolds him for being careless. “How come you did that when there was a police car in front of you! Is your eyesight failing as well?” She goes outside to vent her emotion. Gye Jin-Seong asks what will happen next. Sergeant Park assures her that since this is the boy’s first offence, he’ll probably get probation. He’s a minor so his parents should be responsible for educating him. But they know he is now alone in the world. They are in a quandary. Then they see that the boy is eating his meal. That gives Gye Jin-Seong a sigh of relief. She questions why he should be punished when he is not a criminal. Gye Jin-Seong goes out to shop at the market for vegetables and men’s underwears. She goes to Kang Cheol-Min’s house which has been in a state of neglect. She cleans the space, rearranges stuff, and washes dishes. She is still up on a chair after realigning the light when Lee Young-Oh enters the house. Surprised, she loses a footing. He catches her before she falls. She counters whether she should scream if she were happy to see him then. She has been thinking about how to apologize to him anyway. She figures he is looking for Kang Cheol-Min’s medical records or prescriptions to find out Kang Cheol-Min’s doctor. She had tried looking but found nothing there. She wonders about the kind of father-son relationship between Lee Geon-Myeong and Lee Young-Oh that a father can turn in his own son. She gestures to a picture of Kang Choel-Min and his son, put on a wall. “A father-and-son relationship should be like that.” It’s a father and son smiling, surrounded by caring and supportive notes. Those notes draw Lee Young-Oh’s attention. Those had been written at the back of what was once prescription paper. He finds out Kang Cheol-Min’s doctor. Meanwhile, in Director Shin’s office, Dr Hyeon observes a printer that seems stuck. After he fixes it, it prints out the Kang Cheol-Min’s medical record. It’s the copy that Gye Jin-Seong has asked the insurance company to send. The name in it seems to surprise Dr Hyeon. He calls the person to confirm it. Lee Young-Oh gives the name of the culprit to Chairman Kang. 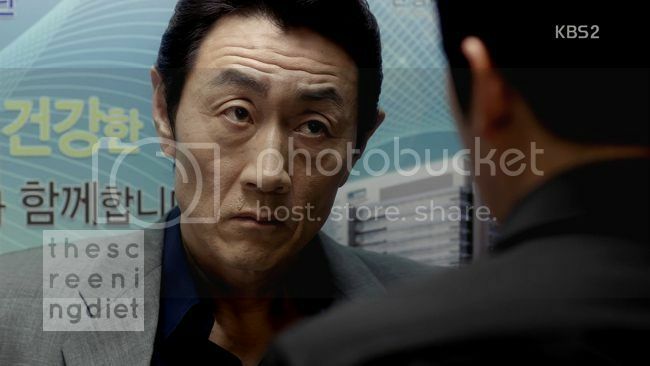 Moments later, Chairman Kang receives a call from reporter Kim who teases him about his headline, a serial killer at Hyeon Seong Hospital, and asks for an exclusive report. Chairman Kang doesn’t seem fazed. He’s been handed a present at a perfect timing. “So, all I need to do is to catch the monster, right? And then I can talk about patient safety to JCI,” he says. Lee Young-Oh also wants Chairman Kang to announce that there had been nothing wrong with his surgeries. The mortality conference commences. Chairman Kang brings up the series of cases that have happened at Hyeon Seong: the deaths of Kang Cheol-Min, Director Shin, and Dr Shim. He calls them murders, not medical malpractices, by one of Hyeon Seong’s own. Both Gye Jin-Seong and Hyeon Seok-Joo find out that Kang Cheol-Min’s doctor was Chae Soon-ho. Yet Chairman Kang announces that the culprit is Lee Young-Oh. Lee Young-Oh simply asks if Chairman Kang has got evidence to support his accusation. A window to Kim Min-Jae’s past shows how she learnt about Lee Young-Oh’s condition. At a branch of Hyeon Seong Hospital in a suburb, she found an article featuring Lee Geon-Myeong, applauding his effort to give his adoptive son a normal life. She also found a medical record on Lee Young-Oh, which also contained his brain scan. The diagnosis mentioned damage to part of his brain that processes emotion and his inability to feel others’ emotion. Kim Min-Jae recalled her conversations with Lee Young-Oh, and how, in light of the diagnosis, his once romantic heart-fluttering words and intense gazes took on a different meaning. He gazed so he could read her physical cues. He held her hands to feel her pulses. He got into a romantic relationship with her, used her, to pass on as normal. She called Lee Young-Oh and asked why he went out with her. After listening to his answer, she just told him “I feel the same way too…” with a broken heart. His words would mean nothing as he couldn’t have felt such emotion due to his brain damage. She cried her heart out. Dr Chae tells Seok-Joo that Director Shin died because of that very reason: asking questions, digging into Kang Cheol-Min’s case, worrying too much and thus getting sick. He worries (warns more likely!) Seok-Joo may end up the same if Seok-Joo goes down the Director Shin’s path. But it is Lee Young-Oh who gets arrested for Hyeon Seong’s murder cases, including Dr Shim’s — her heart arrest came after Lee Young-Oh administered a medicine. 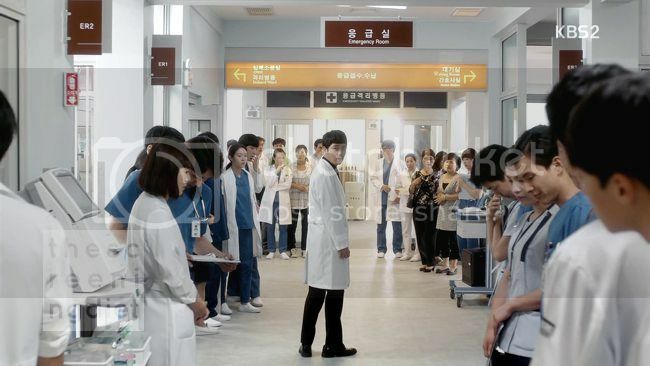 In the mortality conference, Chairman Kang concludes that since Lee Young-Oh is unable to empathise with others’ pain and suffering, he doesn’t have a doctor’s conscience. “Is that why you did that?” Chairman Kang asks. He brings in the police and Lee Young-Oh is arrested and taken away. Kim Min-Jae’s thesis, involving Lee Young-Oh and his condition and directly handed to Chairman Kang, earns her professorship. Chairman Kang praises and congratulates her. Although she remarks unpleasantly that it’s easier to have a psychopath like Lee Young-Oh take the blame. It makes them all feel less guilty. Her encounter with Dr Lee Geon-Myeong brings up a question to both of them. Both have got special relationship with Lee Young-Oh and thus suppose to know him better. “Do you really think he’s a murderer?” No one answers. 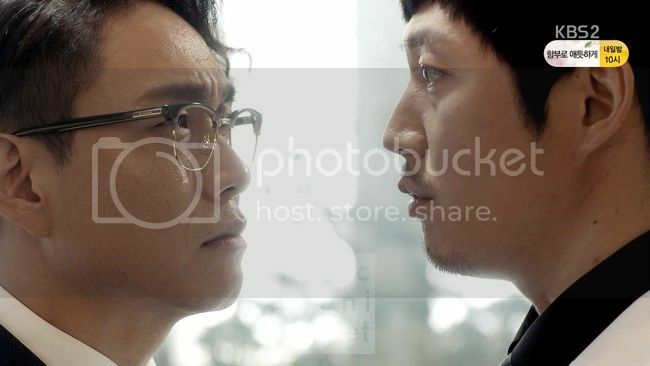 In an empty operating hospital, Hyeon Seok-Joo presses Kim Yoon-Gyeong to tell whether Ji-An has been part of the research. Kim Yoon-Gyeong confirms and says that there is nothing she wouldn’t do for Ji-An. She did it in exchange for a promise that Ji-An will be put on top of waiting list for heart transplant, a promise made by Dr Chae. She leaves Hyeon Seok-Joo standing aghast, and then prepares herself for a surgery. When a doctor tells her that Lee Young-Oh has been the culprit of the murders in Hyeon Seong and is arrested, she is mildly surprised. But then she is shaken, unable to enter the operating room. Kim Yoon Gyeong enters a medicine storage room and gives herself an injection. She takes out her phone and sends message. Lee Young-Oh plays up. Telling lies and truths that the lie detector sends inconclusive results. The detective and the operator gets frustrated. The operator leaves the room. A lie or truth? Or both? Angered, the detective throws a glass to the wall behind him. Lee Young-Oh neither blinks nor flinches. 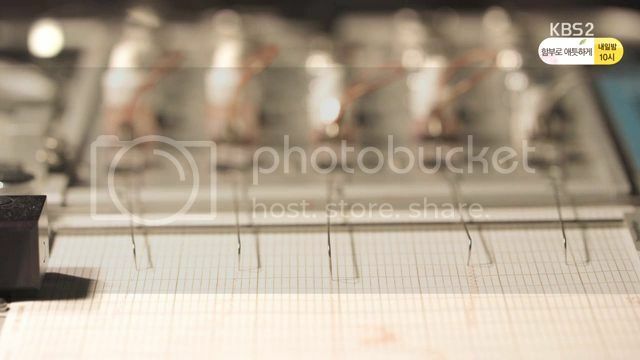 He removes the lie detector sensors from his body as Gye Jin-Seong enters the room. The detective curses and leaves the room. Gye Jin-Seong offers to treat his wound but he silently refuses. “I may not feel the depth of pain but I have a hunch.” She takes his hand and places a handkerchief on it. “I know you don’t want it and this might not help. But I cannot just do nothing. Did I answer your question?” She then tells him to return to the operating room. Officer Gye submits an evidence of murder weapon: potassium. The substance goes undetected in autopsies and is easily obtained by anaesthetists. It has been injected into Kang Cheol-Min and Director Shin some time during their operations by Dr Kim Yoon Gyeong. Ridden with guilt, Kim Yoon Gyeong has been injecting substances into herself. In her high, she also injected lethal dose of potassium that led to her death. She had left a message to Hyeon Seok-Joo that she would turn herself in. She asked him to take care of her daughter. Lee Young-Oh reminds Chairman Kang of his innocence. Chairman Kang maintains that even so, he cannot let a psychopath doctor hold a scalpel. Chairman Kang points out that his conscience wouldn’t let him. “Are you that scared that I might expose your secrets, one by one?” Lee Young-Oh challenges him. Chairman Kang shows him Kim Min-Jae’s report. “She came to me first.” And that is news to Lee Young-Oh. She snaps out of her reverie and jests. She casually remarks that it turns out that the mighty Dr Lee Young Oh is easy to fool. Since he is unable to empathise, he wouldn’t be hurt by these sort of things, would he? The words get to him. He lets her go. Officer Gye vows to make sure that Kang Cheol-Min’s son goes to school and graduates. Even if she’s got to send him there herself financially. Or physically. After one such occurrence, she relaxes at a pojangmacha and orders a drink. She gets a call from ‘One More Bottle’, Dr Hyeon, who reminds her of her past misdemeanour. “You’ve got surgery coming. You aren’t suppose to be drinking.” He happens to be drinking alone at the same tent. Her mercurial demeanour has changed a lot since then as he recalls her parting message, asking him to save Ji-An. Dr Lee Geon-Myeong surprises Chairman Kang and Dr Chae as he plans to apply for the directorial position that Director Shin left vacant. It has been a position for which Dr Chae is eyeing. Dr Lee Geon-Myeong explains that it is because of Director Shin Dong-Jae’s legacy, the regenerative medical treatment centre, should not be a plaything in stock market. Dr Shim Eun-Ha should not have been dragged as well. Chairman Kang should be held in check and a hospital director can do it. But Dr Chae taunts with Dr Lee’s son, Lee Young-Oh, who would bring Dr Lee’s competence into question. Dr Lee doesn’t answer the taunt. A patient is brought in to A&E for falling down the stairs. He insists to call for his wife. From his physique and scars, Lee Young-Oh immediately tells that he is a glioblastoma patient. The wife comes and confirms Lee Young-Oh’s deduction. But she wants to bring her husband home, refusing treatment. Lee Young-Oh highlights the danger of doing so but the wife insists. She shows him the husband’s will and a document to decline treatment — they have decided not to accept treatment that will prolong his life. She also stated that she has the legal right to act on behalf of her husband. Lee Young-Oh, however, questions whether that has been the husband’s wish. Even though the husband confirms his wife’s story, Lee Young-Oh reads the patient’s and the wife’s gestures and suspects the contrary. He declares that he will save the patient. The patient then has convulsions. Lee Young-Oh instructs resident Dr Yang to prepare for surgery, ignoring the wife’s cry for him to stop. The patient has an arrest. Against the wishes of the wife, Lee Young-Oh does all he can (which includes drilling to the patient’s head, ouch!) to get the heart beating. He manages to get the patient’s vital signs back on the monitor. As he turns around, everyone has been watching in suspense. He faces the wife and, with a victorious tone, informs her that her husband is alive. Both husband and wife cry, overwhelmed. Whether by joy or sadness, Lee Young-Oh couldn’t tell. When Dr Oh Kyeong-Jin asks why he ignores the legal request to refuse treatment, Lee Young-Oh is sure that the patient wants to live. It doesn’t matter how he can be so sure of it. He has done his best as a doctor to keep him alive. Dr Lee steps back. He announces to everyone present that the Hyeon Seong Medical Centre’s ethics committee has dismissed Dr Lee Young-Oh. In a daze, Lee Young-Oh walks out of the hospital. 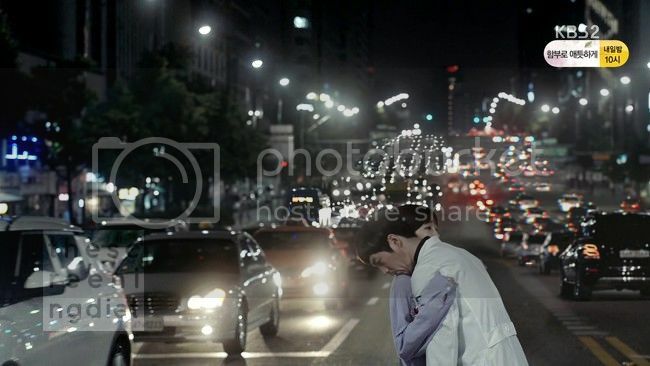 He recalls what has happened while he is walking aimlessly: the patient’s wife desperate and fatal action, Kim Min-Jae’s question of love, his father’s training him to read expressions when he was a child, his father’s last words of opposing monster like him becoming a doctor. At a crossing, someone pulls him back for he is about to step on a busy road while the pedestrian light is red. Instinctively Lee Young-Oh punches him until the man falls down. He keeps throwing punches. It was like the birthday prank gone wrong all over again. Until he realises his surrounding, where a crowd has gathered. He asks one of them what he had done wrong as a doctor. Then he trips over the man he’d beaten. The state of the man and the faint bruises on his knuckles should tell him the answer. Still in daze, He turns around and continues crossing the busy street, heedless of the roaring cars. Someone turns him around. It’s Gye Jin-Seong. She asks whether he is okay and assures him that he need not worry. She takes his hand to lead him away but he pulls her back. As his consciousness is fading, Lee Young-Oh whispers to her ear, “help me, please.” His head falls on her shoulder. This was the week that made me decide to cross that boundary to recapping. It had me transfixed, largely because of Dr Kim Yoon-Gyeong’s story arc and the fall of Lee Young-Oh. I’d been anticipating Lee Young-Oh’s downfall, he had been too arrogant and his masterminding ways need a few checks. When it did happen though, when his scheme came undone and he’s wrongfully treated, my heart sank. It’s been pointed out elsewhere that there were shaky setups here and there. One such instance is the glioblastoma patient story, if they’d wished for no treatment then why bother coming to the hospital at all. But the casts gave such an interesting presentation, I turned blind eye to some of these blunders, but not to some others. At the time of this writing, the series has ended and I’d seen the end. There is one coming that has got me laughing for its ridiculousness and absurdity. But I’ll get to that point when I get there.